L’Oreal X Isabel Marant Lip and Cheek Gloss ($12) is a new glossy, sheer cheek and lip tint that launched in collaboration with street designer, Isabel Marant recently. Isabel actually launched an entire collection of items with L’Oreal quite quietly in my opinion as there hasn’t been a big splash with this collection but I suspect it might be featured heavily in Spring 2019 promos! This isn’t the first time L’Oreal teamed up with a designer to create a collection as they did do a collection of lipsticks with Balmain Paris as well. Both that collection and this one are available exclusively at Barney’s and Ulta. I have so many cheeks stains it’s a bit absurd. It’s actually my look of choice on the weekends! I tend to dab a little concealer under my eyes, curl my lashes (no mascara), and just pop on some cheek stain and go! I just look younger without a bunch of makeup on my face lately and I feel like it’s a like easier to dab so little on and go! Here’s some thoughts on this formula! So, if dewy is your deal you’re going to love this formula! I’ve actually seen a few different videos with suggestion to apply it as an eye gloss but I haven’t tried it like that yet since the color is very pigmented and strong! I’m not sure how I’d look with glossy bubblegum eyelids! This comes in a simple MAC-like square barrel with bring print on it that says “AMAZE Cheeks, They Are All the Craze!” It’s $12 and holds 0.26 oz of gloss. I like the packaging, it reminds me of MAC or NARS and it looks quite modern and slightly edgy for L’Oreal. I have to admit I was shocked as hell when I tried this out for the first time. A little tiny dab will get you VERY intense pink cheeks! It’s crazy pigmented so a little goes go a very long way. A lot of people have complained the formula is too sticky and sets dewy which is all true but there is a solution to that which I’ll explain in a little bit. 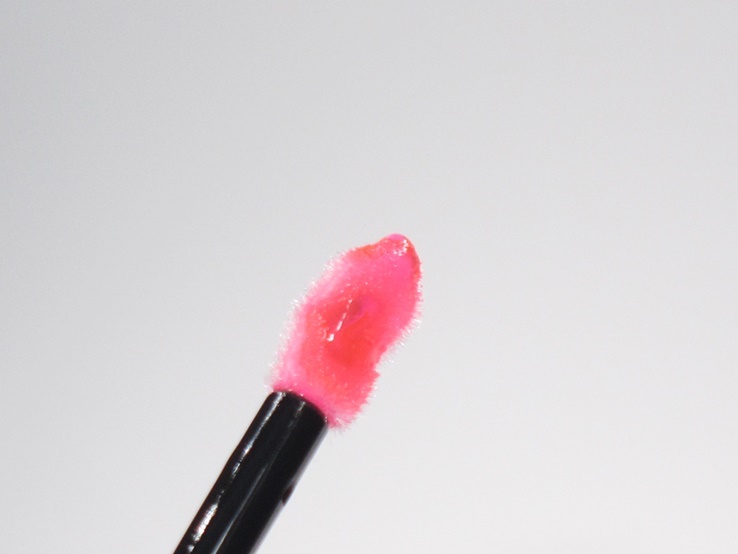 The tint comes with a slightly crimped up sponge applicator that fits along the contours of my lip line quite nicely. It smells like vanilla however, it has a perfume-y vanilla flavor I wasn’t keen on. I liked the formula a lot on my lips. It feels like a luxurious lip oil with a slightly tacky feel that spread easily on my lips leaving them with a highly glossy finish and a nice moisturizing feel. This is one of those self-adjusting pinks that stars out sheer but it gets more and more pink after several minutes of wearing it. Most people refer to it as a candy or a bubblegum pink! It’s quite intense probably the most intense I’ve seen in stains like this. I know the shade won’t be a hit with everyone but I tend to like shades like this so, I was cool with it. I did want to note that my friend has considerably darker skin than my own and she purchased this, wore it, and really knocked it out of the park! It looked amazing on her. For reference she’s a shade lighter than Lupita Nyong’o. On her lips, on her cheeks, and on her eyes it just really made her glow! She rocked it. So, if you are a WOC you might want to check it out! For lips, I think the formula is lovely. It feels very moisturizing, it looks very glossy, it didn’t feel terribly sticky or tacky, and it wears for about three hours without migrating and it does leave a stain behind once it disappears. First off, it does blend amazingly well on cheeks! I mean the application is so damn simple! The only thing that should concern you is the amount you use! I thought it would apply sheer but it does not. It’s very intense so a little dab should cover your entire cheek in a pretty pinched pink! You can always build as you go if you want more intensity or your skin is darker than mine. I think the finish is debatable. It made me look quite shiny and oily but it was easy enough to fix. It also felt quite tacky and sticky and never truly set but didn’t slip or slide away and wore for a solid eight hours while providing at least five hours of dewiness (after about the six hour some of that dewiness faded away and I was left with just a nice flush of pink). Some people really like a dewy finish and in that case this will do the trick to get you pretty, dewy color on your cheeks. If that’s not your thing, no problem! There are a few ways to fix that issue! First off, once you apply and blend you can take a towel or a tissue and just gently wipe your cheeks. The dewiness disappears quite easily. You can also just set it with powder! I used Too Faced Peach Blur Translucent Smoothing Finishing Powder on top of it and I was able to easily tame the dewy, sticky finish and was left with just a natural flush of pink on my cheeks! 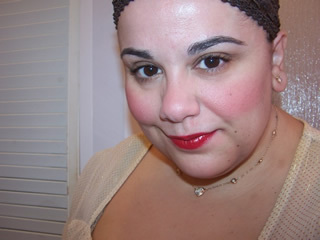 Overall, L’Oreal X Isabel Marant Lip and Cheek Gloss was a win for me. I actually really liked this. If L’Oreal wanted to do more shades or even create a lip oil in this formula or a clear version I’d totally buy it. I thought the formula very moisturizing on my lips and the pigmentation was outstanding for all day wear on my cheeks! L’Oreal X Isabel Marant Lip and Cheek Gloss is 0.26 oz in size and $12. This is a multitasking lip and cheek gloss that was created as part of a collaboration collection between L’Oreal and designer Isabel Marant. The product can be used add a moisturizing, glossy, intense tint of pink to lips or as a dewy blush on cheeks. I thought the formula was quite moisturizing on lips with an intense glossy finish that felt very hydrating on my drier lips. It is a bit stickier and tacky on cheeks with a dewy finish that lasts hours after application and can be easily tamed down with some tips I recommended in my above review. The pigment was amazing so a little goes go a long way to give cheeks a burst of just pinched pink! Wears very long and strong. Amazing pigment, a little goes a long way to give cheeks a bright, intense tint of pink! Moisturizing on lips, wears very comfortably, and feels as nourishing as a lip oil! Has a bitter perfume vanilla flavor. Can look oily or even shiny on cheeks (but can easily be tamed down as instructed above). If you want a youthful flush of color on cheeks I think L’Oreal X Isabel Marant Lip and Cheek Gloss should be a winner of a product to provide it! Looks remarkably natural, once you were done, and rather a winter pink to me, but not so candy/gum. Nice for/on you.